It's summertime, and along with weather and temperature, there's another stat to keep watch for: air quality. A hot humid day may deter you from venturing outdoors, but should you also be concerned about a high Air Quality Index? Yes. The air we breathe is not pure. It may contain thousands of chemical and biological substances. Some of them are in the air naturally, while others are the byproducts of factories and cars. And it can kill. 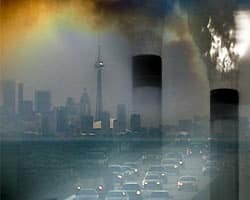 About 4,200 Canadian deaths were associated with long-term exposure to poor-quality air between 1998 and 2000, according to Health Canada. And another 1,800 deaths were associated with short-term exposure to poor-quality air. But what exactly is in the air that causes harm? And what do these readings actually mean? The Air Quality Index (AQI) is a scale that measures amounts of pollutants in outside air. The lower the rating, the better the air quality. The readings are produced using data from different air-monitoring stations across each province. Every hour, AQI stations analyze the air looking for six common pollutants, and the amount found is rated on a scale. The pollutant with the highest level becomes the AQI reading. What are the different ratings and what do they mean? If poor ratings are expected for a period of time and over a large area, a smog alert is issued. What pollutants are in the air? Where do they come from? What could they do to me, or the environment? Where can I get local Air Quality Index readings? Up-to-date AQI readings for all provinces are listed here. In July 2007, the City of Toronto launched the Air Quality Health Index (AQHI) as a means for residents to gauge daily health risks from local air pollution. Earlier pilots have been conducted in B.C. and Nova Scotia. The AQHI measures health risks on a scale from 1 to 10+ on a daily basis. Higher numbers indicate people should scale back their own home energy and vehicle use, and take extra precautions to protect their health. The AQHI creates different readings, based on the combined effects of multiple pollutants, for the general population as well as at-risk groups, including the elderly, children and people with pre-existing heart and breathing problems. Torontonians can check the AQHI at Environment Canada's Weather Office.